Between his four years in the U.S. Navy and a globetrotting childhood that took him from Israel to Alaska, David Martin has lived in three countries and three states. As such, you wouldn't think he'd be one to settle down. But when asked about his plans for graduation, he had a surprising response. "I plan on taking classes at St. Scholastica for the rest of my life." That's true even after he graduates with a degree in marketing and continues with his full-time job at the Minnesota Department of Veteran's Affairs. 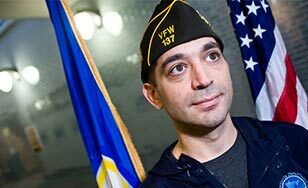 And with help of CSS' Veterans Resource Center and the educational benefits from the U.S. Department of Veterans Affairs (VA) and the state of Minnesota, he can. When Martin left the Navy in 2011, he relocated his family from Norfolk, Va., to Duluth. And when he got here, he wanted to pursue what he considers to be veterans' greatest benefit — education. "With my post-9/11 benefits from the VA, the costs would be covered wherever I went," Martin said. "So why not go to the Ralph Lauren of colleges?" So he enrolled at St. Scholastica — and the Veteran Resource Center (VRC) was here to help. Through one-on-one support and various programs, the VRC eases veterans through the admissions process, guides them through the ups and downs of college life, provides them with a space on campus they can call their own, and helps build a community welcome to all. "I'm a Jewish-Israeli who was raised as a Mormon attending a Catholic school and I've always felt good here," Martin said. In addition to being a full-time student, Martin also has a full-time job with the Minnesota Department of Veterans Affairs, serving as the Northeast Regional Coordinator for the Higher Education Veterans Program. In that role, he helps veterans apply for education benefits, understand enrollment processes and make the transition to college. And when he does, he often recommends St. Scholastica. "Every college is different. Some are more veteran-friendly than others," Martin said. "We're definitely good at CSS. They really go out of their way to help us here. It's a very military-friendly school." This veteran-friendliness is also evident in the flexibility Martin and other veterans are afforded here. He can take most of his classes online and do much of his work from the Veterans Resource Center, leaving him enough time to fulfill his duties as a full-time father, husband and owner of two cats, two dogs, a chicken and a rabbit. And though it's hard work, he appreciates the opportunity. "The hard part is over. School is fun," Martin said. "I just want to learn as much as I can now. It's great having that option, because most people don't. That's why I feel very lucky to be where I'm at."